Saint Alexander, patron of the Lombardy city of Bergamo, has his feast date on August 26 which is also the anniversary of his execution. 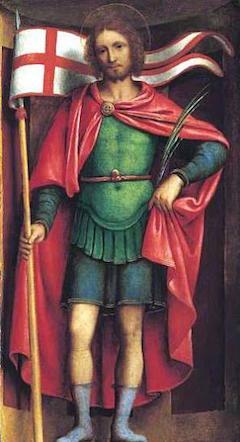 A character for the muscular Christianity required by the rising religion’s imminent conquest of imperial leadership, the purported Alexander was a soldier — indeed, he was said to have been a part of the legendary all-Christian Theban Legion, which was violently discharged during the Diocletian Persecution. Despite a supposed post-military career preaching the outlaw faith on the run from the authorities, Alexander invariably appears in iconography in his martial aspect, dressed in the armor that signified his station and the ambitions of his cult’s later promoters. 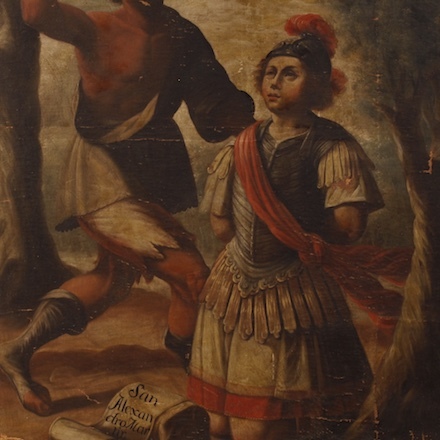 One such depiction, ready to stride into battle with the pennant of his faith, surmounts the Bergamo Cathedral which is dedicated to Saint Alexander.